Our Bear den visited one of the local treasures in Carlsbad, the MaGee House. This wonderful house from Carlsbad history is a wonderful place to visit with your family. It dates back to the late 1800’s and has been kept true to the historical nature of the time. 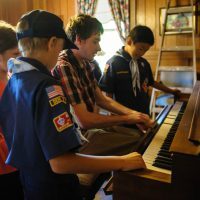 The curator gave our boys a tour of the home, spoke about the historical significance of the home, and even demonstrated how the self playing piano operated.